Alongside Big Cypress Bayou seems an unusual place to perform a surgical procedure. That doesn’t stop Mike Montagne with the U.S. Fish and Wildlife Service from carrying out surgery on a paddlefish—a species that’s more than 300-million years old. They are one of the most ancient fishes and species that we have on the planet. They don’t look like any other fish, and they are super cool. Montagne inserts an acoustic transmitter into the abdomen of a fish that’s been anesthetized before stitching it up and releasing it back into the water. Receivers along the bank track the fish. Overharvesting and manmade changes to habitat, caused the species to disappear from east Texas waters. Restocking, with an emphasis on recreating natural flows, helped the fish and habitat to rebound. 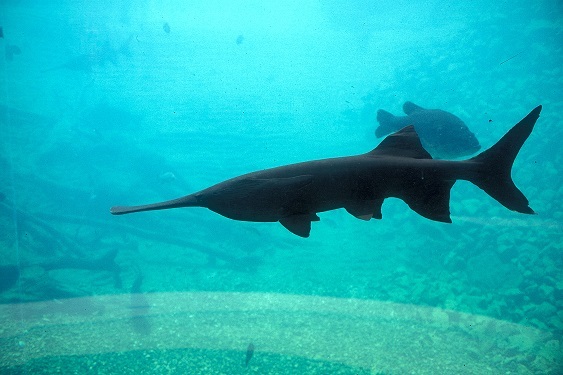 [Laura-Ashley Overdyke] The Paddlefish were the perfect poster child to explain and test out our theory that more natural flows would help the forest as well as all these fish and other animals. That was Laura-Ashley Overdyke with the Caddo lake Institute and Biologist Tim Bister. Find out if the fish stayed in the system, or went over the dam, when you watch the TPW TV Series on PBS this week. You are currently browsing the Passport to Texas weblog archives for the day Tuesday, April 2nd, 2019.